An armament return by Jervois, dated 16th. March, 1869, showed the intended armament of Gilkicker to be 5 - 12 inch guns of 25 tons, 17 - 10 inch guns of 18 tons and 5 - 9 inch guns of 12 tons. 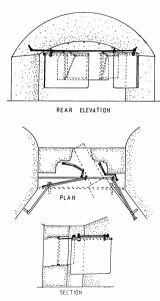 In July 1870 the Royal Artillery and Royal Engineers Committee recommended that the gun positions on the roof at Gilkicker should be completed with ordinary embrasures with the intention that iron shields be provided ultimately. In The Illustrated London News of 29th. July, 1871 an article stated that Gilkicker had received 'a portion of its armament‘. The article added that the intended armament was to be 9 inch guns of twelve tons weight and those which had been mounted were mostly fitted with Mr. Cunningham‘s traversing gear. An illustration shows guns being mounted on the roof and the article gave details of the equipment and men needed to raise two 25 ton guns onto the roof. The number of artillery men employed was 140 and Captain William Smith, Gunnery Instructor of the 12th Brigade of Royal Artillery was in charge of the whole operation. It took one hour and a half to raise one gun, using huge sheers 70 feet in length and 2 feet in diameter, aided by two capstans with forty men to each. 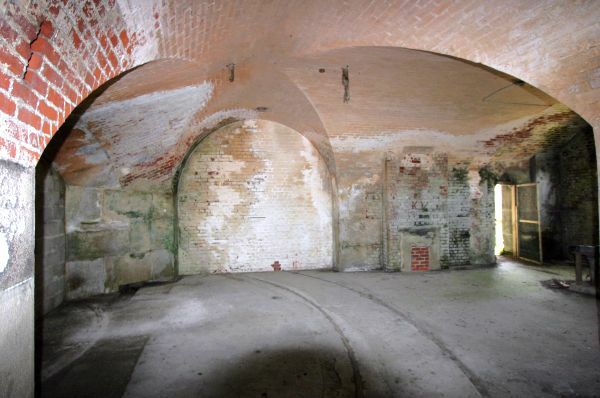 Experimental firings were carried out at Fort Gilkicker in 1870 and problems were found with the compressors, the metal plates fixed to carriage and platform used to check the recoil of the carriage and barrel after firing. 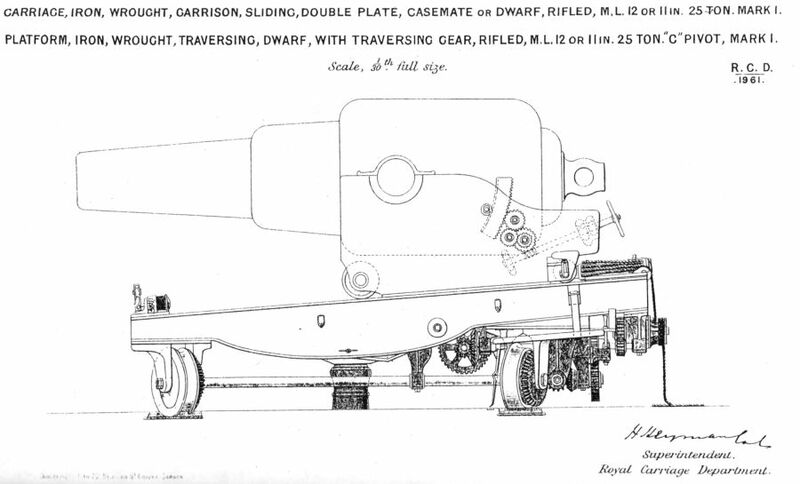 ...difficulties that have been experienced, and are now felt, in getting pivots, platforms, &c. on the ordinary system, strong enough to mount the new artillery, where the recoil is stopped by friction applied directly by means of what is technically called "compressors" attached to the platform; these difficulties, that the first two twelve-ton guns on ordinary carriages that were fired in casemates (which happened a few months ago) at Gilkicker Fort, were both hors-de-combat after the first shot. This alarming event showed that, with all the experience of ancient and modern artillery (and the carriages referred to were the legitimate exponents of the results of experience), there was still room to doubt whether the problem of meeting recoil had been at that time completely solved by the existing system. The accident referred to was serious because it might occur in action, and in that event, would disable the gun pro tempore as completely as if it had been dismantled by a shot. The proposed armament of Gilkicker seems to have been changed many times and the actual armament is rather confused. On 19th. December 1870 the Committee approved 10inch Rifled Muzzle Loaders on casemate platforms as the main armament for the casemates at Gilkicker. An illustration in The Illustrated London News of 25th. October 1879 shows at least four guns in place on the roof at Gilkicker. A table of armaments, dated 1880 shows only 4 x 9 inch 12 ton guns mounted. In 1872, the Director of Artillery had requested that designs of traversing platform for 12 inch 25 ton R.M.L.s be installed at Gilkicker. By 1885 two of them were installed. A plan of the 1890s shows racers in casemates numbers 20, 21, 22, 1 and 2 for 9inch guns whilst casemates numbers 3 to 19 had racers for 10inch guns. The radius of the racers were 9-inch guns - 6ft. 3ins and 16ft. 6ins; 10-inch guns - 8ft. 0ins and 18ft. 0ins. 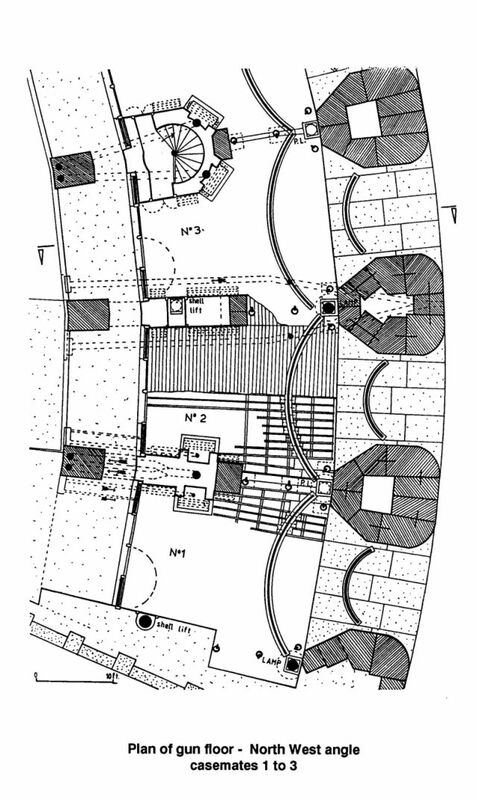 This same plan shows what looks like thirteen shields (or shield frames) in place although this is contradicted by a report from the Defence Committee in July 1884 which states that the casemates received only ten of the proposed shields and a further eight had shield frames. 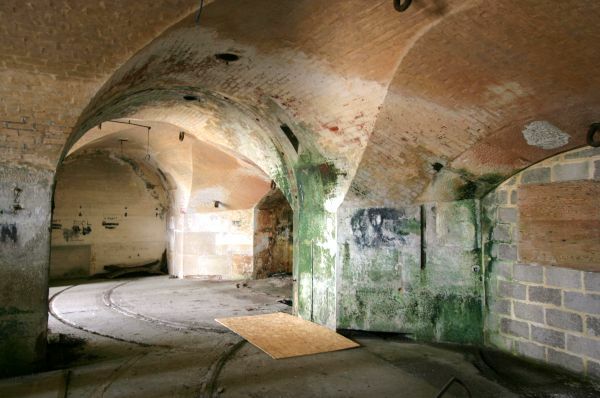 It was proposed to take advantage of this situation to strengthen the superstructure by adding traverses in some of the casemates. This would afford greater protection should projectiles burst inside the work. 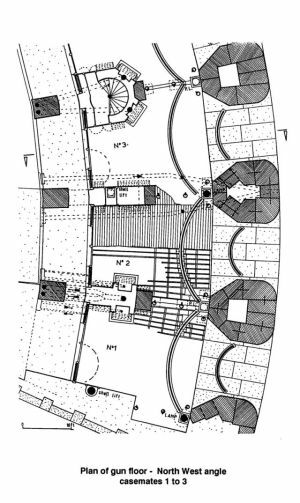 The plan has proposed alterations pencilled in and these indicate that casemates 2, 6, 10, 14, 18 and 21 were to be filled in as traverses. Casemates 1, 17, 19, 20 and 22 are labelled as 9 inch guns whilst casemates 3, 4, 5, 7, 8, 9, 11, 12, 13 and 16 are labelled as 10 inch guns. Casemate 16 is labelled as no gun. The 10-inch guns were fitted with mantlets. At the same time the ditch in front of the work was to be filled in to strengthen the security of the magazines. 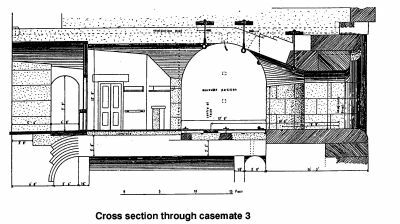 The Committee recommended that this work be carried out with the omission of shields from casemates 15 and 17 (although the plan shows 17 as having a shield) which it considered were unlikely to be attacked by armoured ships. This was considered in the light of an imminent proposal to mount two additional heavy guns for the defence of Stokes Bay. 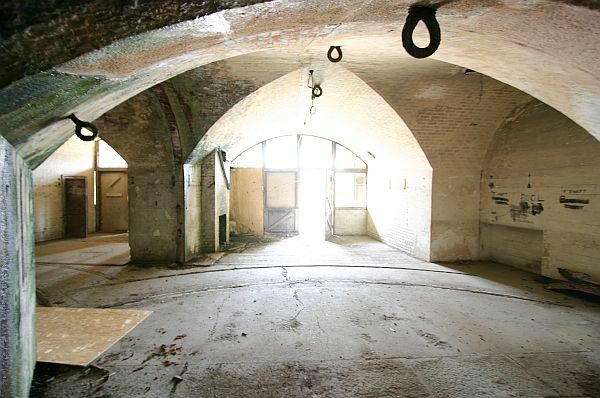 (Browndown Battery was re-modelled to receive two 12.5-inch R.M.L.s in 1888 and completed in 1889). The Secretary of State for War approved the proposals on 29th. March 1886. Mr. Cunningham was a Major in the 3rd Hants Volunteers living in Bury House Gosport. He attended the 1868 trials at Gilkicker because in 1858 he had been informed that the Secretary of state for War had adopted his new system of traversing guns for all land service guns of 12 tons and upwards. His new traversing gear consisted of a chain upon which a toothed gear mechanism acted to winch the gun around. This new method allowed the guns to be trained to the full extreme and required only two men as opposed to ten men for the old method. Cunningham was present at Gilkicker when three training tackles of the old block and rope variety were destroyed in one morning’s exercise. His new gear with its galvanized chain was imperishable and he remarked that a gun fitted with it would be ‘serviceable for one hundred years’! The guns could be fitted with this new gear without them having to be removed from their position to a factory. In 1867 several members of the Ordnance Select Committee watched Mr. Cunningham demonstrate his new traversing gear at Fort Gilkicker. The guns at Fort Gilkicker were crowded, with little room between them to allow safe an efficient traversing in action. Once Cunningham's traversing gear was fitted the Committee were impressed by the speed at which the guns could be traversed. In a previous demonstration a 9-year old boy, who happened to be watching, was found to be quite capable of moving a gun over the arc of training with quite sufficient speed under the conditions. Guns could now be traversed from extreme right to extreme left by two men in 62 seconds. To protect the gun crew operating each of the 10-inch RML guns mantlets were fitted to the inside of the gun port and shield. These rope curtains were pulled close around the muzzle of the gun and were drenched in sea water to prevent them from catching fire. 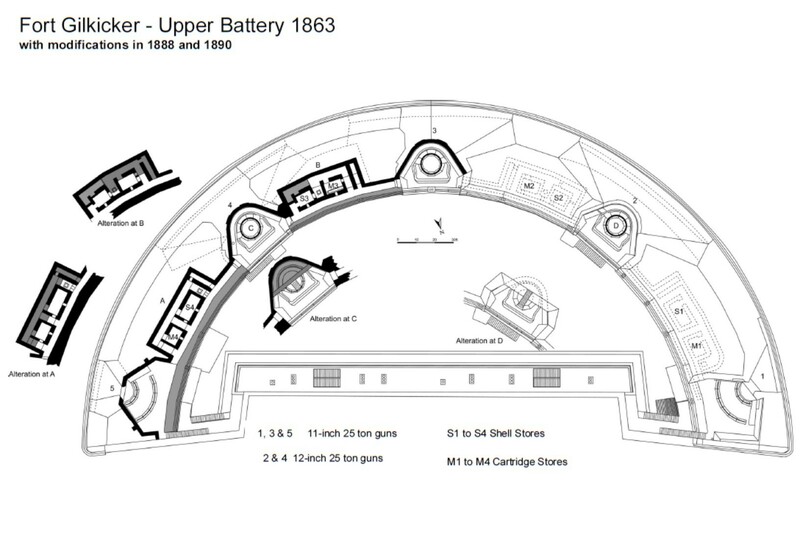 An armament list of 1886 states that two 12-inch 25 ton guns were installed on the upper tier of the fort (the roof), together with three 11 inch R.M.L.s. The lower tier had ten 10 inch and five 9 inch R.M.L.s. The list also shows seven 13 inch S.S. mortars on charge at Gilkicker. A design had been laid before the 1869 commission for an auxiliary battery of 16 Sea Service mortars on the left flank of the fort between Gilkicker and Fort Monckton. 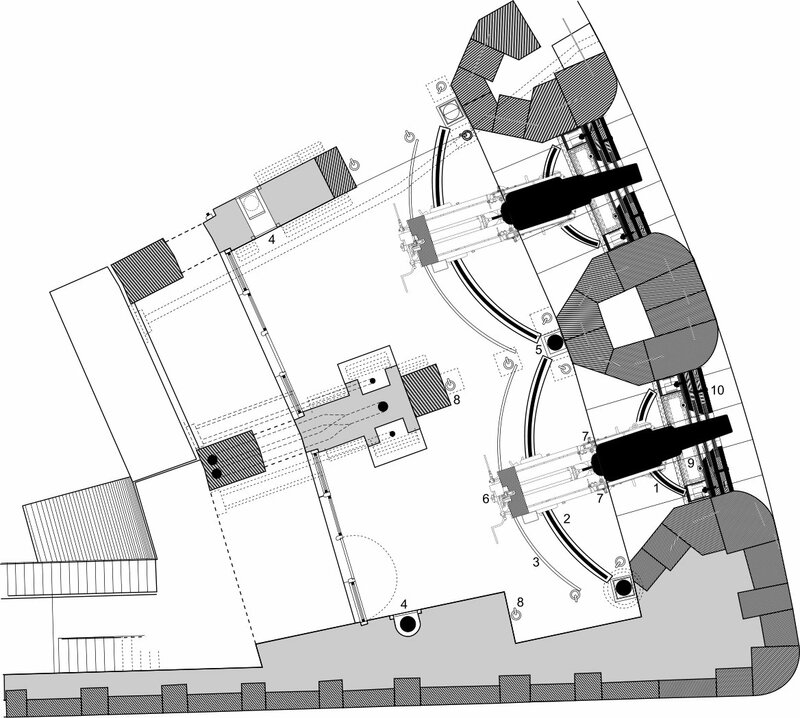 The Commission considered it to be ' ...well calculated for its object‘. Something of the sort may well have been constructed but no trace of it remains. In 1886 it was decided that six of these mortars, not yet mounted, should be moved to a site close to No.5 Battery. The design had not then been finally approved. The battery was never constructed. The roof positions at Gilkicker were completed under a separate contract, the contractor being Jaz Gosling. The authority for this was dated June 1864 and was commenced 17th. June 1870. 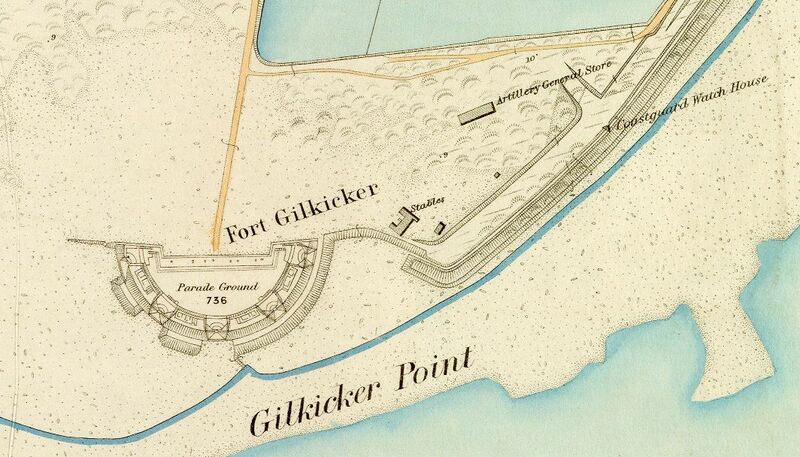 The estimated cost of Fort Gilkicker in 1869 was £61,395, the actual cost on completion being £58,766. The contract was completed by Mr. J. T. Leather who was also the engineer in charge of the construction of the forts in the sea at Spithead. His construction yard, referred to as Leather Town, was close by at Stokes Bay. At Gilkicker five gun positions were constructed, three for 11inch guns of 25 tons on 'C' pivots in positions 2, 3 and 4 and two for 12-inch guns of 25 tons on 'A' pivots in positions 1 and 5. The positions were numbered from the right (west to east). Each position had a look out platform. Between the gun positions were pairs of chambers, one for shell and the other for powder, numbered one to four. These were entered through covered passages from the gun positions. A shell lift from the basement stores emerged in each pair of magazines. In 1890 magazine no.7 in the basement was altered so that a powder lift could supply the roof positions via roof magazine number three. 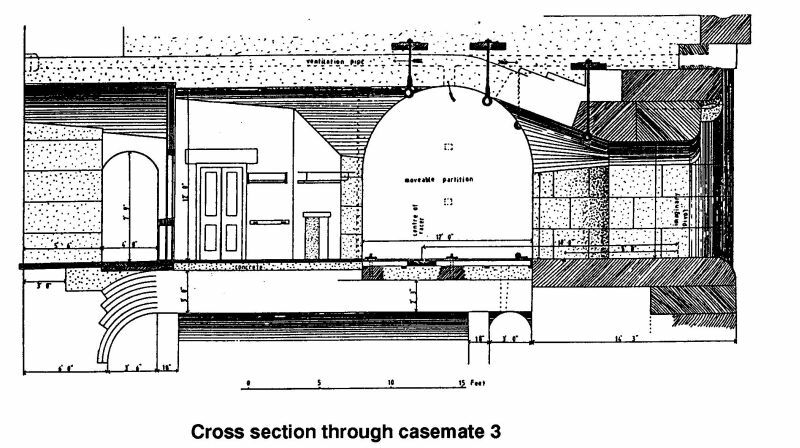 Fort Gilkicker: Cross section through casemate no.3. 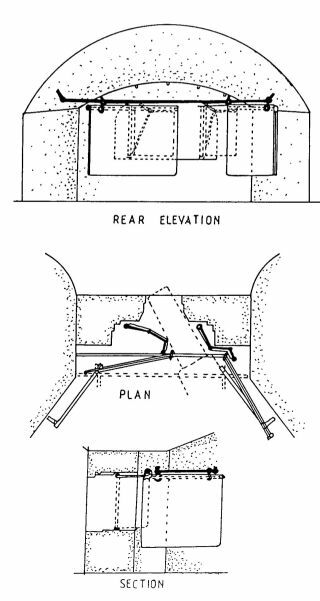 Fort Gilkicker: Plan of gun floor, north west angle, casemates 1 to 3. Fort Gilkicker: Mantlet for 10-inch guns. 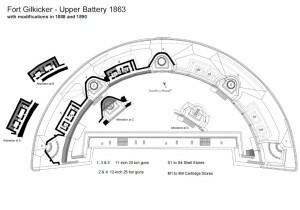 Fort Gilkicker: Plan of Upper Battery in 1863 with modifications to 1890. Fort Gilkicker: Gun casemate for 10-inch R.M.L. guns. 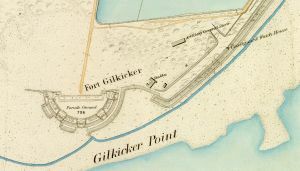 Fort Gilkicker: Gun casemate for 10-inch R.M.L. guns looking towards barrack area. 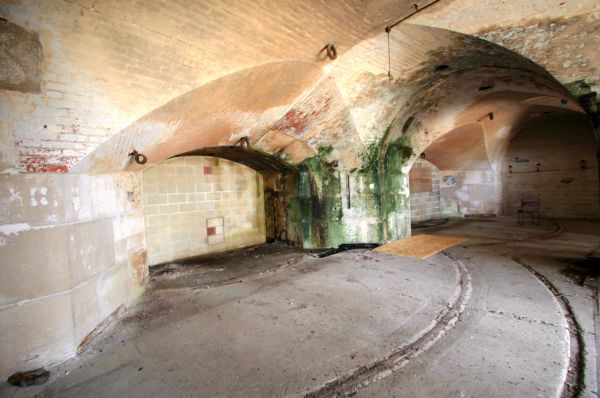 Fort Gilkicker: Gun casemate converted to filled shell store for 6-inch B.L. guns.